You’d be hard pressed to find someone against glamping. It’s like puppies, or Italian cuisine, or the smell of fresh leather in a new car—you can’t hate it unless you don’t have a soul. Combining the luxury of a five-star staycation with the serenity of nature, glamping is the dream treat yo’self getaway (boys, take note). 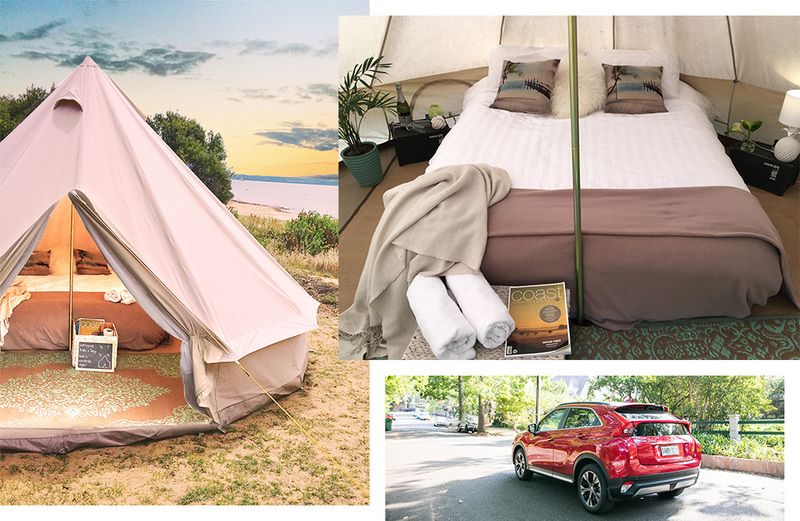 To celebrate the launch of the brand new Eclipse Cross (ft. leather seats and all the features in the world), we teamed up with Mitsubishi Motors to find all the best glamping spots near Melbourne. Nestled on the edge of the foreshore, Phillip Island Glamping is one of the most idyllic spots in Victoria. One of the more basic glamping options (who needs spas when there’s an entire sea at your doorstep), expect queen-sized mattresses, basic kitchen utensils, puffy AF doonas and more pillows than you’ll see in IKEA. Along with the biggest regional gallery in Australia, European-style laneway bars and DIY breweries—Bendigo has a brand new glamping spot. Set on the working vineyard of Balgownie Estate, 15 luxury bell tents are decked out in errything you could possibly want from an outdoor weekend away (minus the stray bullants). Expect an eco-friendly hot tub, queen sized bed, split system air con, a well-stocked bar fridge, tea and coffee, and approximately a bazillion rugs, blankets and squishy pillows. Excuse us while we move there. Set up anywhere under the sky with, well, Under Sky. Along with pop-up glamping hotels (the last location at Mount Zero Olives sold out), Under The Sky supply towering accommodation for weddings, corporate retreats and festivals. Your next rave is sorted. If your natural habitat is similar to a seal’s, Happy Glamper should be your top choice. Happy Glamper gives campees the freedom of choosing their own campsite along the Mornington Peninsula. Simply choose and book a campsite, and the team will set up your personal pop-up glamping experience. Run by a husband-and-wife team, Prom Coast Eco Glamping is currently set up in two locations in South Gippsland. Underlying the business is a genuine love and respect for Victoria’s stunning natural environments. You can elect to nominate your favourite campsite—the team will take care of the setup and pack up. Did we mention their Lotus Belle Tents are like 5m from the beach? Get next level cosy with Cosy Tents. Along with the usual luxuries (goose down quilts, Bose Bluetooth speakers), Cosy Tents offers breakfast boxes delivered to your tent door and personalised Moët champagne and choccies to really impress your bae. While it’s not exactly glamping, Notel offers the next best thang. Set on a CBD rooftop overlooking the skyline, this pastel pink-themed spot is home to chic, refurbished Airstreams. There’s not much nature around, but you will have access to Melbourne’s best restaurants, bars and late-night events at your fingertips. We think it’s a pretty good trade. Editor's note: This article is proudly sponsored by Mitsubishi and endorsed by The Urban List. Thank you for supporting the sponsors who make The Urban List possible. Click here for more information on our editorial policy.